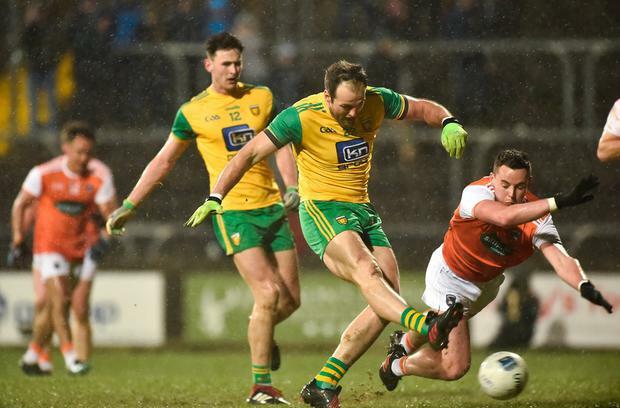 Donegal won ugly on a brute of a Ballybofey night as Michael Murphy made a timely return. Murphy and 2012 All-Ireland winning team-mate Leo McLoone led the way for Donegal to get their promotion bid back on track. Murphy's goal, just before half-time, set Donegal on the road here, with the captain only introduced in the 28th minute to restore some order to the night. Donegal's Jason McGee and Armagh's James Morgan saw red 10 minutes earlier and referee Martin McNally showed 11 cards in all. 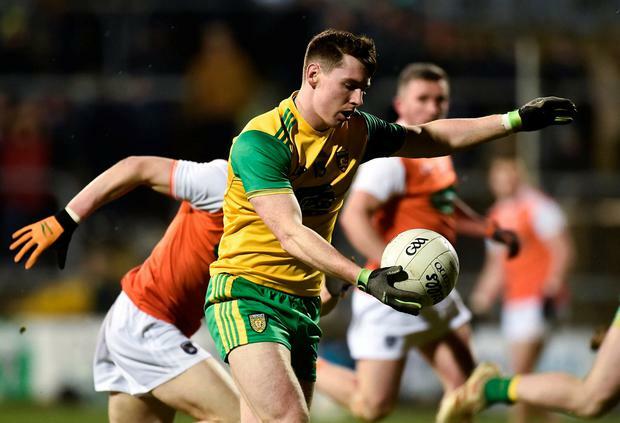 After back-to-back defeats Donegal had to win and, thanks to an inspired display by Murphy on his first outing of the year, they did just that. "The leadership qualities of Leo and Michael were invaluable," said Donegal manager Declan Bonner. "They made major contributions. The goal and two points Michael got were invaluable, but Leo's steadying influence from centre-back was vital. Michael Langan kept Donegal in check from frees until Murphy slotted home a goal in first-half stoppage time. Murphy landed two beauties to push Donegal clear, but when Niall O'Donnell spurned a free - with a chance that could have put the hosts five up - the jitters started to creep in. 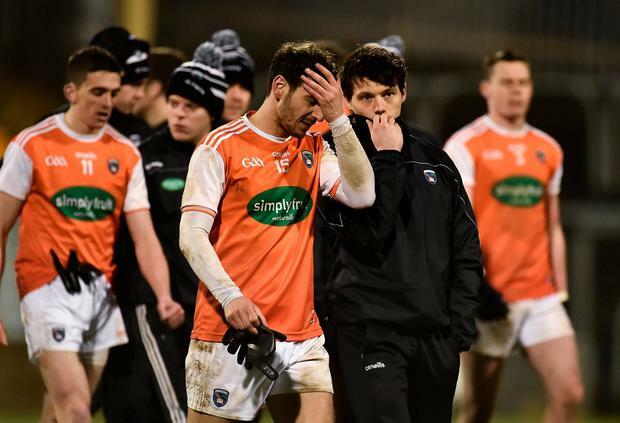 Rian O'Neill gave Armagh hope, but they ran out of time. Bonner said: "It was about real grit, real desire and a will to win. That was really good to see." 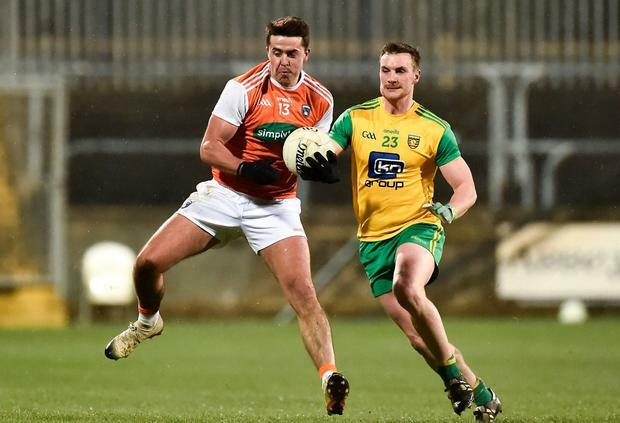 Armagh - B Hughes 7; J Morgan 5, A McKay 6, R McShane 6; C Mackin 7, G McCabe 7, P Hughes 6; S Sheridan 6, N Grimley 7; J Hall 6, R Grugan 7, C Vernon 6; S Campbell 7, R O'Neill 7, J Clarke 6. Subs: R Kennedy 6 for McShane (h-t), E Rafferty 6 for Campbell (39), J Burns 6 for Vernon (63), M Shields 6 for Hall (63), J McElroy 5 for Mackin (69). Fermanagh were worthy three-point winners over Clare at Brewster Park as Rory Gallagher's men continued their unbeaten run in Division 2 yesterday. With two games left, one win will secure Fermanagh promotion to Division 1, a scenario scarcely any Erne supporter would have envisaged at the start of the year. Fermanagh were much more clinical and it was a flurry of well-taken points from play in the middle of the second-half that was to propel them to victory. The first-half was an even affair, with just a single point separating the sides at the break, as Sean Quigley knocked over four placed balls for the home side. Fermanagh took a grip on proceedings in the second-half and hit six of the first eight points. In defence, the Cullen brothers, Che and Lee, and James McMahon were in imperious form and Clare struggled to break through as they searched for the goal they needed to get back into the game. They had a brace of scores from play, from Jamie Malone, who also picked up a black card with 12 minutes left to play, and Fermanagh were able to make full use of the extra man. Scorers - Fermanagh: S Quigley 0-6 (5f, 1 '45), K Connor (1m), C Corrigan, A Breen, R Lyons, D McCusker, C Cullen 0-1 each. Clare: D Tubridy (2f), J Malone 0-2 each, G Brennan, K Malone, C Finnucane, G O'Brien, E Cleary 0-1 each. Fermanagh - T Treacy 7; J Cassidy 6, L Cullen 8, K Connor 7; U Kelm 7, J McMahon 8, C Corrigan 7; C Cullen 8, R Jones 6; R Lyons 8, D McCusker 7, A Breen 7; K McDonnell 5, C Jones 6, S Quigley 7. Subs: P McCusker 6 for McDonnell (30), E Donnelly 6 for Cassidy (46), D Teague 6 for C Jones (54), D McGurn 6 for P McCusker (67), E McHugh 6 for Breen (69). Clare - P DeLoughrey 8; K Harnett 6, C Brennan 7, G Kelly 7; D Ryan 7, A Fitzgerald 6, C O'Dea 6; G Brennan 7, C O'Connor 6; K Malone 6, S Collins 6, J Malone 7; E Cleary 6, D Tubridy 6, C Finnucane 6. Subs: K Sexton 6 for Malone (48), S O'Donoghue 6 for O'Connor (48), G O'Brien 6 for Finnucane (54). They were made sweat to the end as Tipperary came at them with a frantic rally but Cork were good value for their victory, and the relief was palpable as Rebels' manager Ronan McCarthy digested their first win of the campaign. 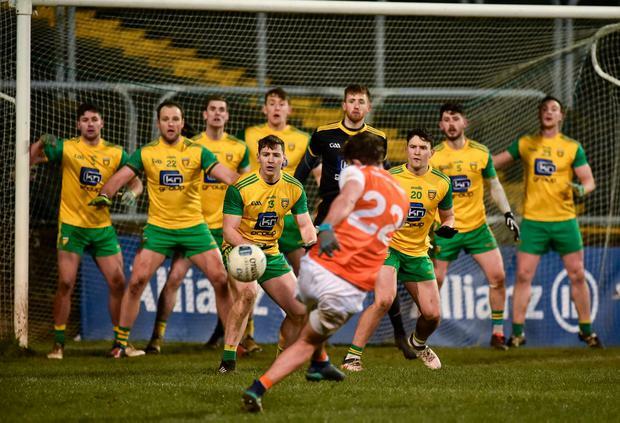 There is still a fair bit of work to do against Donegal and Armagh if they are to avoid dropping to the third tier of the league for the first time, but McCarthy is hopeful that the confidence gleaned from this win, in front of just 1,179 at Semple Stadium on Saturday night, will propel them. A goal from Ruairi Deane four minutes from time wrapped up a badly needed win but they still had to survive a spirited fightback from a Tipperary side with their own considerable relegation worries. "It's massive, there was an awful lot riding on the result," said a relieved McCarthy. "I thought we played some really good football in the second half, There's a lot more in them, that's the message that we'll give to them and we'll excuse the hesitancy at the end, we were hanging on a bit. Hopefully we'll see it in a couple of weeks' time again. "We control our own fate in the league and that's a big thing for us - that we're not depending on anybody else." Cork led by 0-7 to 0-4 at the break having played with the wind but they pushed on after the restart and landed four points, with the impressive Luke Connolly getting a brace and Cillian O'Hanlon and Mark Collins also finding their range. Sean Powter set Deane up for a fine goal that opened a six-point lead but while Tipperary rallied and got it back to three, they were unable to equalise despite going very close in a hectic finish in a crowded goalmouth. "They're all must-win games, it's very tight," said Tipperary manager Liam Kearns. "I don't think there's any easy games for anybody left in this but there's nothing decided yet. There's two games to go and it'll be tough." Scorers - Cork: L Connolly 0-5 (4f), R Deane 1-0, M Hurley, M Collins (1f) 0-2 each, C O'Hanlon, P Kerrigan, E McSweeney 0-1 each. Tipperary: C Sweeney 0-7 (0-6f), J Kennedy (1 '45) 0-2, D O'Meara (f), K Fahey, B Fox 0-1 each. Cork: MA Martin 8; S Ryan 6, K Flahive 7, C Dennehy 6; K Crowley 7, T Clancy 6, M Taylor 6; I Maguire 7, K O' Hanlon 7; E McSweeney 7, L Connolly 8, R Deane 7; M Hurley 7, M Collins 7, P Kerrigan 7. Subs: B Hurley 7 for M Hurley (54), C Kiely 6 for Taylor (54), S Powter 7 for Kerrigan (54), D Gore 6 for McSweeney (62), R O' Toole 6 for Maguire (66). Tipperary: M O'Reilly 7; A Campbell 6, J Meagher 7, E Moloney 6; K Fahey 7, D Brennan 6, J Feehan 6; S O'Brien 7, L Casey 7; L Boland 6, L McGrath 6, B Fox 7; P Austin 6, C Sweeney 7, J Kennedy 7. Subs: D O'Meara 6 for Boland (54), B Hyland 6 for McGrath (62), C Kennedy 6 for Fahey (66), C O'Shaughnessy 6 for Meagher (68). Ref - F Smyth (Offaly).